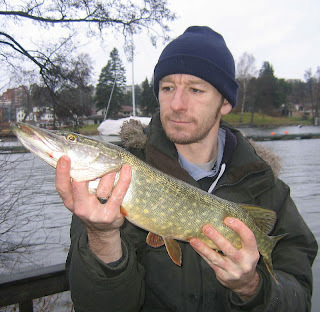 Formed in 2013, this is an expat specimen fishing group based in Stockholm, Sweden. Many of those taken part have been fishing for some years together now and it's time for a fresh challenge, namely, specimen coarse fish. Join us as it all unfolds..
Fantasy Fishing League Results 2007! Another year passed already and time to add the bonus points for the biggest of each species caught. 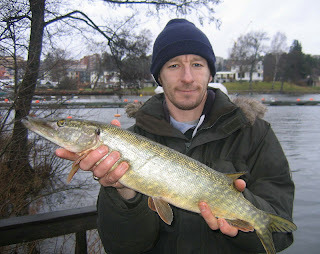 Biggest fish of each species caught as follows..
Pike; 12lb 8oz., Tyresö Slott; 5th April 2007; Al. Perch; 1lb 10oz., Tyresö Slott; 30th August 2008; Al. Roach; 2lb. 8oz., Dalarna; 15th July 2007; Rafal. Rudd; 1lb 9oz., Drevviken; 18th June 2007; Al. Bream; 3lb 3oz., Tyresö Slott; 30th August 2007; Al. Tench; 4lb 3oz., Drevviken; 27th August 2007; Al. Jim and James both failed to score, though only got out for one day in 2007. Baz failed to score as he was not out at all once during the year! No armchair award is available Baz! The table pretty much reflects the hours spent out fishing and there is no real shortcut to catching a lot of fish, hours on the bank pay off. Here's to a great 2008 to you all and hope to see you all out there! Thanks to all for a great year in 2007 and some great days out... Hopefully can organise a trip or two away in the coming year and encourage a few more people to get out into the fresh air. Though it is not easy for us all to get out as much as we used to due to family commitments and work, hope 2008 will be a good one for you all in every way. Pike; Alan Dalton; 13lb. 2oz. Rainbow Trout; Alan Dalton; 3lb. 15oz. Salmon; Alan Dalton; 17lb. 6oz. Bream; Alan Dalton; 5lb. 10oz. Orfe; Alan Dalton; 6lb. 1oz. Zander; Ed Bowler; 7lb. 1oz. Tench; Andy Shaw; 5lb 11oz. Perch; Ed Bowler; 3lb. 14oz. Rudd; Alan Dalton; 3lb. 6oz.